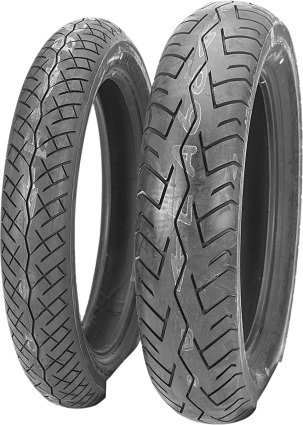 Rim Diameter: 21" & 17"
Sport touring bias-ply tires for mid-sized sport-touring bikes and older sport bikes. Features silica enriched compound for exceptional wet and dry grip. Dual Tread Compound (DTC) in the rear allows for longer mileage than single compound and better stability from center, while shoulders offer grip and performance while cornering. Larger crown radius contributes to excellent stability for high-speed touring. H-rated for speeds up to 130 mph.